This fine church with its magnificent spire stands at the very heart of the County Town of Bedford. Surrounded on all sides by historic buildings, St. Paul’s serves both as a Parish Church and as the Civic and County Church of Bedfordshire. In addition to possessing many treasures from the medieval and Victorian era, the church is justly proud of its liturgical and musical tradition today. With its busy programme of daily services, the church seeks to be open for pilgrims and visitors alike, and to offer a haven of tranquillity at the centre of this busy borough. We are a parish church in the Diocese of St Albans and part of the worldwide Anglican Communion - a member of Churches Together in Bedford and of Bedford Council of Faiths. This historic church was formed in 1650. John Bunyan was to be the minister following his release from prison in 1672. He remained until his death in 1688. The present building was erected in 1849. Scenes from The Pilgrim’s Progress are depicted on the magnificent entrance doors and in some of the finest samples of 20th and 21st Century stained glass windows. 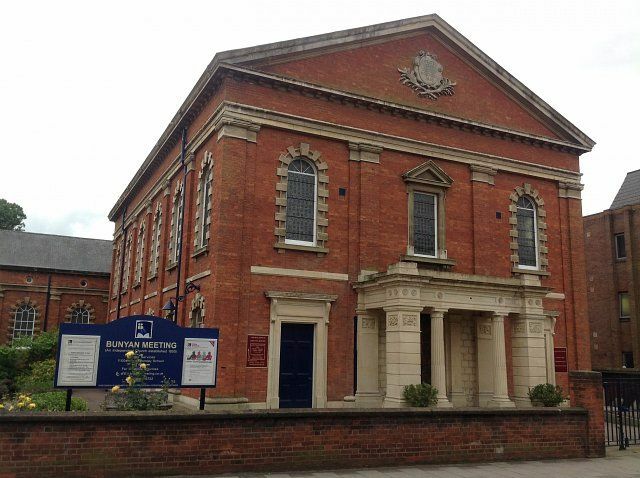 This beautiful building, steeped in Christian history, is today a living centre of Christian worship and service to the community. Bunyan Meeting is a member of the Baptist Union of Great Britain and of the Congregational Federation. The congregation is drawn from many denominational backgrounds and is ecumenical in outlook.